To investigate the effect of full-length fragment of DNA topoisomerase I gene (TOP1) matrix attachment regions (MARs) originating from the human genome on transgene expression in Chinese hamster ovary (CHO) cells and explore the underlying mechanisms. 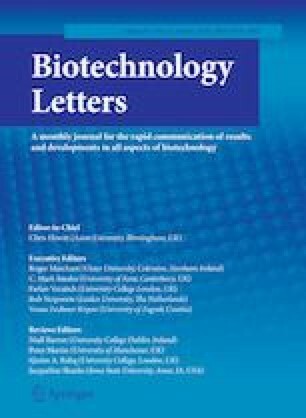 Results showed that TOP1 MAR cannot only enhance the transient and stable transgenic expression of enhanced green fluorescence protein (EGFP) but also increase long-term stability and ratio of positive colonies in transfected CHO cells with TOP1 MAR at the 5′ or 3′ ends of the EGFP expression cassette. Interestingly, the CHO cells were transfected with the 5′,3′ TOP1 MAR-containing vector featured the highest transient and stable expression, whereas those with the 3′ TOP1 MAR-containing vector exhibited the most effective stability and ratio of positive colonies. We also observed that transgene copy numbers and mRNA of egfp gene were correlated with the expression levels of EGFP protein in polyclonal CHO cells. However, the heterogeneity of expression in monoclonal CHO cells was unaffected by transgene copy number. The findings may aid in the potential application of TOP1 MAR in expression enhancement of recombinant proteins in mammalian cells. This work was supported by the Grants from the National Natural Science Foundation of China (No. 81673337), the Key Science and Technology Project of Henan (Grant Nos. 192102310149, 182102310194), the Key Scientific Research Projects in Universities of Henan Province (No. 18A350008), the National Natural Science Foundation of China (Grant No. U1804168), the Plan of Scientific and Technological Innovation Team for University, Henan Province, China (Grant No. 18IRTSTHN027) and the Industry-University-Research Project of Xinxiang Medical University (Grant No. 2017CXY-2-1).